I bought some picket fence distress crackle paint ages ago and decided to have a practice on some diecut ornaments. I used scraps of black cardstock so that shows through the crackles. After colouring with some distress inks I coated them with glossy accents for a bit of shine. At Allsorts the challenge is to use at least three diecuts. I've used the Brittany ornament base, the star from the Avondale ornament and woodland branch dies. At Simon Says Stamp Wednesday the theme is Christmas. The Card Concept has a festive glory theme with this gorgeous inspiration pic. My card fits the clean and layered style. 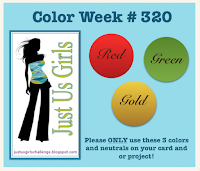 Just us Girls has a colour challenge of red, green and gold. I used scraps of black card for the ornaments and green for the branches so I'm also visiting the snippets playground at Pixie's Crafty Workshop. Dies: Poppy Stamps Brittany & Avondale ornaments; Memory Box woodland branch. Other: Martha Stewart branch punch; gold paper; white picket crackle paint; red & green distress ink; glossy accents; Sizzix embossing folder (part of a christmas set); sentiment sticker; gold cord & bling. Absolutely fabulous Cathy - the crackle works so well. And what a beautiful design as well. Those ornaments came out beautifully! The crackle paint gives a cool effect and I love the gold stars! Also love how you added the greenery to the branch! Love the result you got with the baubles. Lovely layout. Thanks for joining us at Just Us Girls this week. This is so much fun! 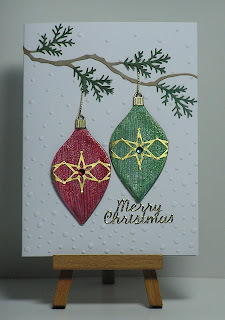 I've never tried crackle paint, but I love the look on your ornaments. The glossy accents was a good choice too. Thanks for joining us this week at Just Us Girls! Wow, these ornaments are beautiful. I must try that. I like how you added the greenery to the branch. So clever. Gorgeous, beautiful Christmas card, love those baubles. I love this. Totally reminds me of my parents' skinny trees in the old days, and some of their "retro" ornaments. I am so intrigued by your crackle paint that I think I will add that to my Christmas Wish List! Beautiful card! Thanks for playing along with us over at Just Us Girls this week!